London, UK, 18 March 2010: Eutelsat Communications today announced the successful completion of the UK-built communications module for its high-speed broadband communications satellite, KA-SAT. 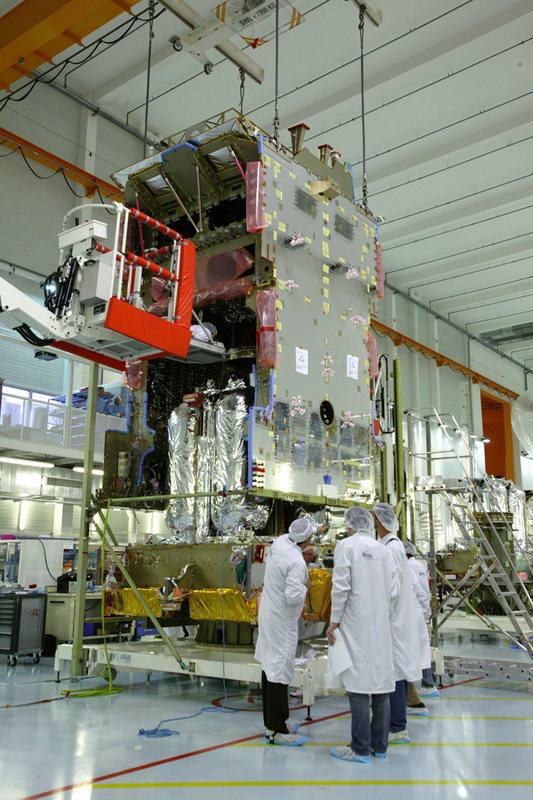 The communications module – the heart of the satellite, designed to receive and transmit broadband services to and from Internet users – has now been transferred from Astrium’s high-tech manufacturing facilities in Portsmouth to Toulouse, France, and integrated with the satellite’s service module for testing before its scheduled launch at the end of 2010. The completion of this module brings the prospect of high-speed 10Mbps broadband access one step closer for the UK’s rural communities. Eutelsat’s existing Tooway™ satellite broadband service, launched in the UK in April 2009, already provides a 3.6Mbps broadband connection to UK consumers via a satellite dish and modem, from just £22.50 per month. Following the launch of Eutelsat’s KA-SAT spacecraft, a dedicated new satellite infrastructure specifically optimised to deliver broadband to homes beyond the range of terrestrial networks, broadband speeds will rise to 10Mbps with higher speeds possible to meet the future needs of consumers for increased internet bandwidth. Today, Tooway™ is already serving customers in more than 25 European countries including Germany, France, Spain, Italy, Switzerland, Ireland and Greece with other countries across Europe rolling out over the coming months. Eutelsat is a leading European satellite operator with 26 satellites providing a footprint of more than 150 countries, and reaching 90% of the global population. Eutelsat Communications (Euronext Paris: ETL, ISIN code: FR0010221234) is the holding company of Eutelsat S.A.. With capacity commercialised on 26 satellites that provide coverage over the entire European continent, as well as the Middle East, Africa, India and significant parts of Asia and the Americas, Eutelsat is one of the world's three leading satellite operators in terms of revenues. At 31 December 2009, Eutelsat’s satellites were broadcasting more than 3,400 television channels and close to 1,100 radio stations. More than 1,000 channels broadcast via its HOT BIRD™ video neighbourhood at 13 degrees East which serves over 123 million cable and satellite homes in Europe, the Middle East and North Africa. The Group’s satellites also serve a wide range of fixed and mobile telecommunications services, TV contribution markets, corporate networks, and broadband markets for Internet Service Providers and for transport, maritime and in-flight markets. Eutelsat's broadband subsidiary, Skylogic, markets and operates services through teleports in France and Italy that serve enterprises, local communities, government agencies and aid organisations in Europe, Africa, Asia and the Americas. Headquartered in Paris, Eutelsat and its subsidiaries employ 635 employees from 27 countries. Skylogic provides satellite broadband communications services for Internet access (via IP protocol) and for television transmissions to corporate enterprises and public bodies. The Turin-based company is a subsidiary of Eutelsat. SkyPark, Skylogic’s teleport, houses one of the largest platforms in the world for two-way broadband IP transmissions. Skylogic’s satellite networks are interconnected by optic fibre to the largest operators in the sector, guaranteeing connectivity in Europe, the Mediterranean Basin, the Middle East, North Africa and America.